What you can do to help keep your pets healthy and protected in the summer heat? Never leave a dog in the car on a warm day, even in the shade and with the windows cracked. In hot weather, reschedule your dog walks for early morning or dusk. Carry water and offer it to your dog frequently. Keep your dog in the shade as much as possible. Use dog-safe sunscreen on light-haired and pink-skinned dogs. Summer, my favorite season, is here. The long days provide me and my dogs with extra time to enjoy all our favorite activities: hiking, camping, long walks, and outdoor adventures. Of course, long summer days also bring the risk of heat exposure to dogs. The consequences of a dog overheating can be very serious. Heatstroke, or hyperthermia, can occur quickly and the result can be deadly. By understanding how dogs keep cool – and what we can do to help – we can ensure our dogs don’t overheat, so we can all enjoy those dog days of summer to the fullest. You may have experienced those very hot days when every pore in your body oozes sweat. Sweating is a very effective cooling mechanism; the evaporation of the moisture on the surface of your skin cools your body. But dogs don’t sweat the way we do, and their ability to cool off is much more limited. Dogs cool themselves primarily through the process of panting and breathing. When dogs pant, the air passing over the saliva in their mouths helps them cool. In addition, the lining of a dog’s lungs serves as an evaporative surface, much like our skin when we sweat. Blood vessels in the face, ears, and feet can also expand, helping to dispel heat from the body. A dog’s body temperature is normally between 100.2° and 102.8° Fahrenheit. When a dog’s cooling mechanisms are overwhelmed, his body may no longer be able to cool itself adequately, and the dog can become overheated. Dogs who get too hot can suffer from dehydration, heat cramps, or heat stress. If a dog’s body temperature rises past 104°, he’s in serious danger. If the body temperature continues to rise above 106°, heatstroke can occur. Heatstroke is a life-threatening condition that can cause lethargy, weakness, collapse, seizure, coma, brain damage, and even death. If the body temperature reaches 109°, his heart, brain, liver, and kidneys can shut down. Fortunately, heatstroke can be prevented. And if caught early, in its initial stages, it is reversible. An overheated dog is, quite obviously, a medical emergency. Even if you are able to cool the dog down, you should seek medical treatment if you suspect your dog has suffered from heatstroke. Problems associated with heatstroke – including kidney failure, respiratory arrest, abnormal heart rhythms, and seizures – do not always show up right away. Immediate veterinary treatment can help minimize the risks and save the dog’s life. Dog’s can suffer from heat stress in just a few short minutes, even when the temperature doesn’t seem that hot to us. How will you know if a dog is at risk for overheating? There is not an exact answer to this question; it depends on the dog and the situation. All dogs are at risk in extreme temperatures. But a dog who is accustomed to 90° weather may have less risk on a very hot day than a coastal pup vacationing in the Arizona desert. And, the air temperature is only one consideration: humidity, sun exposure (or lack of shade), amount of time in the heat, level of exertion, and availability of water can all affect how well a dog tolerates heat. 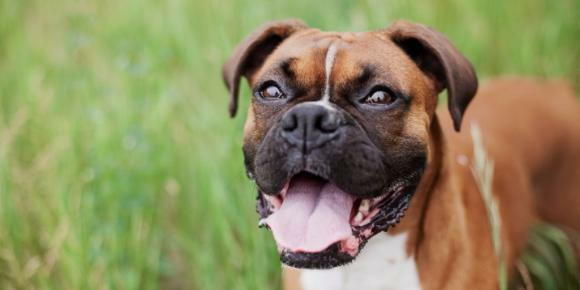 Certain types of dogs, including northern breeds like Malamutes or short-muzzled (brachycephalic) dogs like Pugs and Boxers, can have a more difficult time in the heat. Puppies under six months, older dogs, and overweight dogs can also have a much harder time when temperatures rise. Dogs on certain medications or with medical conditions like heart or lung disease will be more susceptible to heat exposure. A dog who has suffered from heat stress or heatstroke in the past is more likely to have problems again. Plus, we’ve all met dogs who are driven to play or work no matter how tired or hot they get; think of a Border Collie at a Flyball match. Along with the outside temperature and humidity and the health of the dog, you have to take into consideration the dog’s personality and ability to stop himself from playing if he gets uncomfortable. The best way to know if your dog is at risk for heat illness would be to monitor your dog’s body temperature; of course, this is not very practical in everyday life! You can also become familiar with how your dog responds to heat and the signals he gives that indicate he is getting hot. Panting more than usual, declining to engage in a favorite activity, moving slower than usual, searching for shade, or digging for a cool spot can all mean a dog is hot. If your dog is exhibiting any of these signs, it may mean he is already too hot and you should take immediate steps to help him cool off. Leaving a dog in the car is one of the most common causes of heatstroke. On a relatively mild 70-degree day, for example, a closed car can heat up to 120° in a matter of minutes. Because dogs can’t cool off effectively while sitting in an oven-like car, they can quickly overheat. Cracking the windows or parking in the shade may not significantly reduce the car’s temperature. Dogs can suffer heat exposure at home, too. On a warm day, a concrete dog run can heat up quickly. A backyard that lacks shade, or with fencing that blocks cooling breezes, may make the dog’s environment many degrees hotter than where you relax, comfortable, in the house. Neighborhood walks on warm days can also pose a risk. Hot asphalt and concrete can reflect heat, both creating an uncomfortable walking surface and increasing the risk of overheating. Vacation time can pose extra risks for dogs. Vacations often lead us to different environments and climates – and often into the heat. Hanging out at a campsite, hiking on a warm day, even riding in a boat can put a dog at risk for heat-related illness. Beaches, especially if the dog is not inclined to cool off in the water, are also a risk. A dog traveling in the back of a car may get too much sun exposure through the window. Heat is definitely not a dog’s best friend, since dogs lack the ability to cool themselves well in extreme weather conditions. With the rise in dog sports, more us are asking our dogs to run, jump, and participate in other activities on hot summer days. Dogs, especially those who are keen for games or who desperately want to please us, may continue to play no matter how hot the day, or how overheated they are becoming. Along with heat illness, dogs can get sunburned. Just like people, dogs with pale skin and light-colored fur are at greatest risk. Sunburn can increase the chance of heat illness. Regular sun exposure over the long term can cause skin damage and put your dog at risk for skin cancer. Areas commonly affected with sun damage are the ears, nose, and eyelids. dog’s susceptibility to heat exposure. Never leave your dog in a car on warm days. When it’s hot outside, bring your dog inside. If you need the air conditioning, chances are your dog does, too. If you must leave your dog outside, make sure he has plenty of shade, water, and ventilation. Never confine your dog or leave him crated in the sun. Use caution when leaving a crated dog under a shade awning, too. Remember that the sun moves and what was a shady spot can quickly become sun-baked. Provide rest breaks in the shade and plenty of water on all outdoor excursions. Avoid overexertion on hot or humid days. Even if your dog generally joins you on a walk or run, extreme temperatures call for a change in routine. Instead, walk, exercise, and practice dog sports early in the morning or late in the day when the temperature is cooler. A dip in cool water is one of the best ways for dogs (and people!) to cool off. Wet your dog with a hose, or provide water play like a sprinkler or a wading pool. You can also drape your dog with a wet bandana, towel, or T-shirt when it’s very hot. If you are going to a hot environment (such as on vacation in Arizona in the summer) consider purchasing a cool mat or other dog-friendly cooling aids. Be very aware of your dog’s response to the heat, provide extra water, and give him several days to acclimate before allowing him to be active. At the beach, be sure to provide a cool place (like a towel or blanket under the umbrella) for your dog, too. Be especially careful with older or high-risk dogs. Expert recommendations vary on the topic of whether you should clip a dog’s coat to assist with heat management. The ASPCA suggests that for a double-coated dog (like a Chow), trimming the dog’s fur may help. But don’t shave the dog! Leave at least one inch of coat to provide some insulation and protection from sunburn. Generally, long-haired dogs with a single coat (like rough-coated Border Collies) should not be clipped, as their coats may not be dense enough to protect them from the sun when cut short. Heatstroke, or hyperthermia, is when the body’s temperature rises too high. It can cause the heart, liver, kidney, and brain to shut down. A dog who experiences heatstroke can go into shock and may suffer irreversible organ damage. Get your dog out of the heat immediately. Begin cooling your dog down. The easiest way to cool a dog is to wet him down. Use a hose or wet towels. Do not use ice. Get your dog to the vet immediately. You can continue cooling him with wet towels on the way. If you cannot get to a veterinarian right away, monitor his temperature and check for signs of shock. Stop the cooling process when your dog’s temperature reaches 104° F. Do not continue cooling him or the body temperature could drop too low, increasing the risk of shock. Even if you are successful at cooling him off, take him to the vet anyway. Many medical problems caused by heatstroke won’t show up right away. Veterinary treatment is critical. Current, waves, and moving water can be dangerous for any dog, even a very strong swimmer. River currents can be deceptive. Even if the water appears to be moving slowly, the sheer volume of moving water can make it difficult for a dog to swim against the current. Wind and currents on a lake can likewise make for a difficult swim. Ocean waves and rip tides both pose serious dangers to the canine swimmer. Underwater hazards like hidden branches, plants, and debris can snag a dog. Cold water can cause a dog to tire out much more quickly than normal. A cold dog can develop cramps, lose energy, and be at risk for hypothermia (when a dog’s body temperature drops too low). Does all this mean you should keep your dog from swimming on a hot summer day? Of course not! Swimming is great exercise and water is a wonderful way to cool off when the temperature outside is hot. Just use good judgment! In an unfamiliar place, watch the water for a few minutes before allowing your dog to swim. Make sure the currents aren’t too strong. If they are, have your dog splash close to shore rather than dive in for a full swim. Check the water temperature. In a lake fed by snowmelt, for example, you may only want to allow a quick dip to keep your dog from getting too cold. Remove slip collars or training collars before your dog enters the water. These can snag on underwater obstacles. Never take your eyes off your dog when he is swimming. Watch to make sure he is not getting too tired and call him out of the water when he still has plenty of energy. A tired dog has a much higher risk of drowning. None of us (including our dogs) want to give up summer fun or the enjoyment of a warm day. But a little awareness and a heavy dose of caution will help you protect your dog from heat illness. Remember, when dogs get too hot, you can generally tell. They slow down, their tongues hang out, and they may even search for a spot in the shade. Most dogs, given the opportunity, will take steps to keep themselves cool on a warm day. Our job is to make sure they have the opportunity to cool off and to be careful that we don’t ask them to work or play hard when the temperature is too warm for their bodies to handle. Make cooling activities part of your fun together! With a little caution, you and your dog can enjoy the “dog days” all summer long.